This Spinach and Paneer Stuffed Paratha does not mean it is made of Palak Paneer gravy, no. 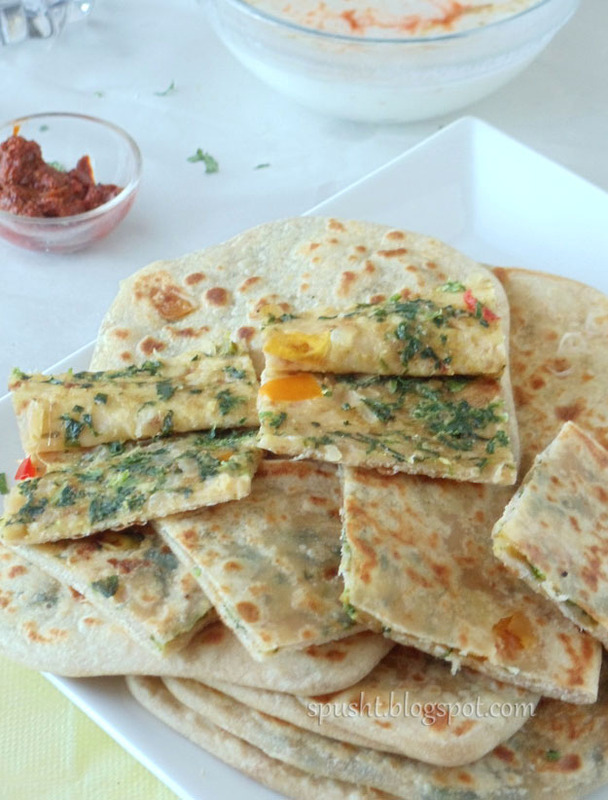 The chopped spinach and crumbled paneer is cooked with spices and filled as a stuffing into the paratha. 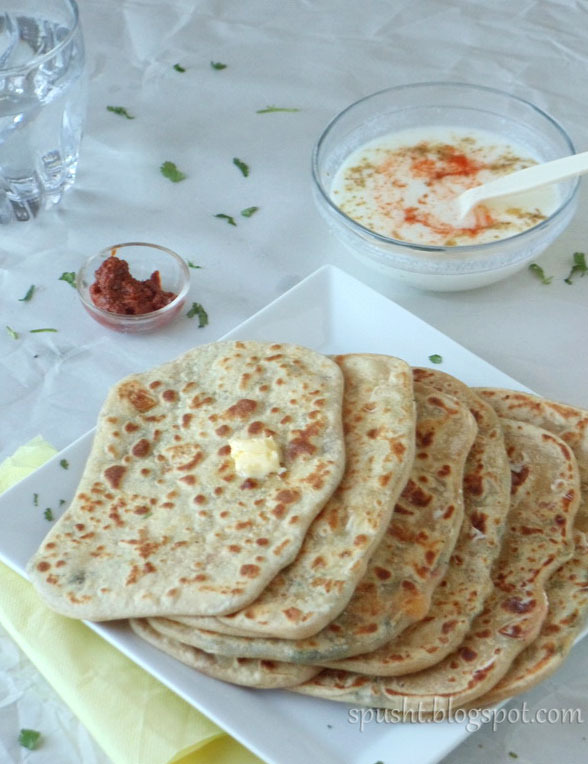 You can make these stuffed parathas for breakfast, lunch, or dinner, or freeze the stuffing and use later to make parathas when you are short on time. 1. Combine ingredients for dough & knead till it is smooth but a little firm, not very soft dough like roti. Keep aside for 15-20 mins. 2. Add ½ tsp salt to shredded spinach, mix well & keep aside 2-3 mins. Spinach releases water when mixed with salt, so drain out the water, but don’t over-squeeze the spinach. 3. 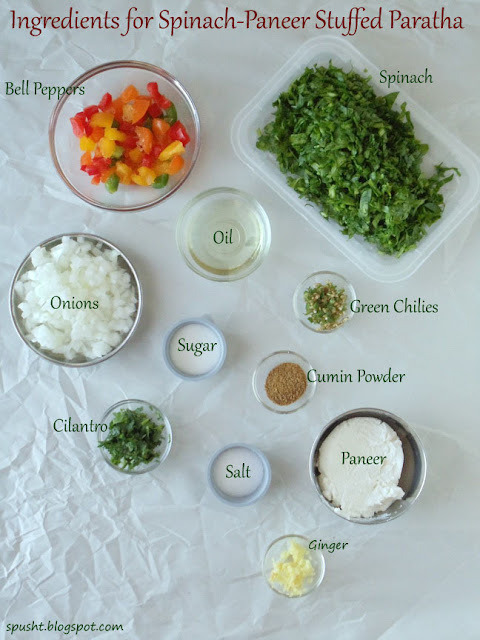 Heat oil in pan, add onion, sauté till translucent, add green chilies + ginger + bell peppers, sauté till little tender. Add drained spinach & all remaining ingredients, mix well. Switch off heat, keep aside. 4. Take 1 portion of dough, roll it into a small oval shaped roti & place stuffing in its center, in a longish way. Fold all four sides of roti over stuffing to enclose & make oblong shaped paratha. Gently press to seat edges. Shallow fry both sides using ghee/oil till golden-brown. 5. Sprinkle chat masala on hot Palak and Paneer Paratha, top it with a lob of butter & serve hot with sweet lime pickle &/ raita. Oh I so wish to have one of these delicious parathas now. They look so good. delicious and healthy parathas,nice idea to feed the spinach to kids. ~ Many thanks, Rachana & Reshmi! Wow .. yummy parathas. Love the clicks and the shape of the parathas. Thx for linking to the event. Love the shape of ur parathas, excellent and healthy definitely. Mmhhh, those look ever so scrumptious! Great stuffing. Delicious looking parathas, so soft and yummy! oh vow, have never come across such a detailed recipe for stuffed paratha!! Panneer is NOT ricotta cheese, it is cottage cheese! "Liquid rennet" is used to make cottage cheese. "Lemon juice/vinegar/citric acid" is used to make ricotta cheese, same as paneer. The Rat Stole My Plum! True Story. I won a Scharffen Berger Giveaway! Humor: Do you wonder if…? Do you ponder why…?